If 2003 was a good hornet year then 2004 was an even better one. Hornets were seen in and around the village throughout the summer and autumn. Although the first record was from mid-June, most reports were received in the autumn when the hornets were much more lethargic and feeding on very ripe or fallen fruit and on nectar. 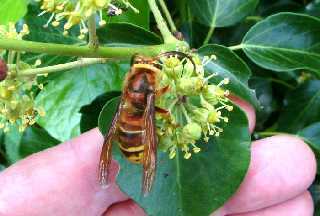 The last recorded sighting was on 24th October on a late flowering ivy plant (see photographs), where a single hornet was passively sharing the plant with a surprisingly wide range of other insects. 2003 did prove to be too good to last and in 2004 there were many fewer sightings of hawk moths. The elephant hawk moth was seen on several occasions and its caterpillars performed their usual destruction on prized Fuchsia plants in various gardens. 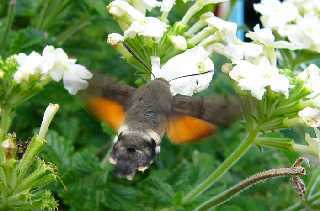 Other native species seen included the lime hawk moth and the poplar hawk moth. There were some sighting of immigrant species, particularly the humming-bird hawk moth, but numbers were very low compared to last year. 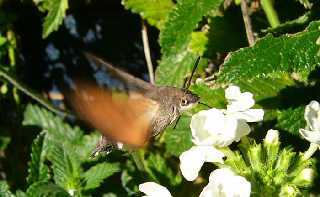 In what must be a very late observation, Jeremy King managed to photograph a humming-bird hawk moth feeding on Phlox in early October, that could well have been the last meal for this specimen before it succumbed to our winter. Buzzards have become a refreshingly common sight soaring over Ashton-under-Hill and Bredon Hill generally in the last few years, so at first glance the bird soaring over the village at lunchtime on 31 May 2004 was not unusual. 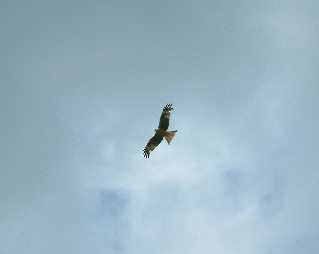 However its behaviour did not ring true for a buzzard, it was circling at a low level and regularly dropping down towards the ground – yes this was a red kite. The bird, with its very distinctive damaged primary (finger) wing feather, see photograph, remained in the area for at least 15 minutes before moving away. The same bird was seen 3 days later in the same area but no subsequent reports of it have been received. This sighting fits in with Mark Turner’s observations in Worcester Record Number 16, so perhaps it will not be too long before we have a thriving population of these spectacular birds in Worcestershire.